Problems that develop in the waste pipe that connects your house to the municipal sewer or the septic tank can stop your plumbing drains cold. If the waste pipe breaks, you'll probably need professional help to repair it, and that can be expensive. It's good, therefore, to be able to distinguish between a breakage and a blockage. You can't always unclog sewers yourself, but sometimes you can, and you'll save money by doing it yourself. In most houses, the main soil stack descends vertically to the main waste line, which exits the house -- usually underground -- and connects with the municipal sewer or the septic tank. The pipe typically runs under the yard, and if you haven't had problems with it, you might not even know where it is. You can usually find it by locating the soil stack, following it to the waste line and following that to its exit point from the house. From there, you can deduce its path to the street or to the septic tank, provided you know where the latter is located. One of the clearest signs of blocked sewers is slow-running drains, especially if you've noticed this problem for a while. You may find the toilets hard to flush, and soap scum collecting in the bathtub, which is caused by slow draining, may be a chronic problem. The water level in a toilet may change by itself; it may be normal immediately after flushing and abnormally low a few hours later. If you have basement drains, you may find white deposits around them caused by water backing up and pooling, then draining again. You may also notice an increased incidence of rats and other pests, which are attracted to the overflowing water. 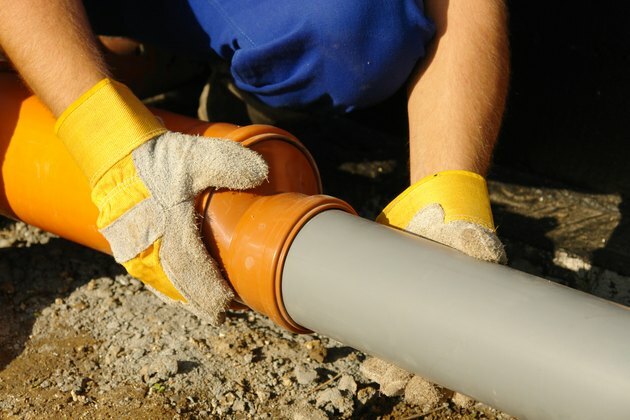 If your sewer lines are broken, your drainage system will probably function normally, but you'll eventually notice telltale signs of the breakage in the basement or outdoors. Because water is escaping onto the surrounding soil, a sinkhole may develop, or you may notice standing water in the yard or on the basement floor. The water will be hard to miss, because it will smell like a sewer. If the sewer goes under a paved pathway or driveway, you may notice deterioration of the asphalt, or individual pavers may sink. Vegetation in the immediate area of the break will be particularly green and happy because of all the extra nutrients it is receiving. The presence of trees or shrubbery in the path of a blocked sewer line strongly suggests that the blockage is caused by roots. If so, you should call a plumber, because removal of tree roots requires an electric snake with a cutting blade best operated by trained personnel. If you don't suspect roots, you may be able to clear the blockage yourself with a sewer auger. To use it, find a clean-out valve through which to insert it -- there is usually one near the house. Call a licensed plumber to repair a broken sewer; besides the messy work involved with the repair, there are codes and regulations to consider. Why Does My Toilet Back Up When it Rains?